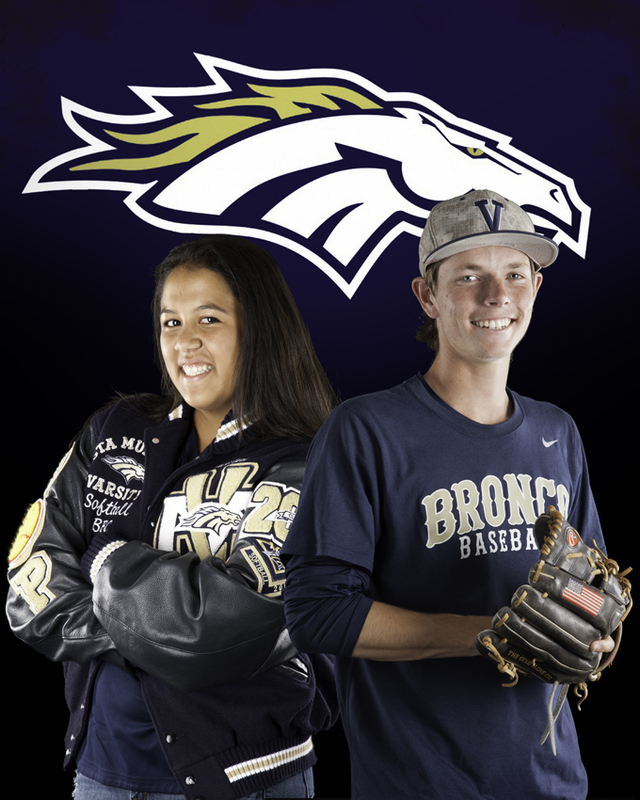 Baseball standout Chance Hroch and softball standout Shealyn Ollison have been named the Murrieta 24/7 Athletes of the Month from Vista Murrieta High School, sponsored by Photos DLite photography studio. Hroch, a senior pitcher, was 11-3 with a 1.27 ERA for the Broncos baseball team, which posted a 21-11 overall record and made it to the second round of the CIF playoffs before losing to Harvard-Westlake in extra innings. Hroch struck out 88 batters to only 23 walks this season. He broke the school record for complete-game shutouts and "has been our leader and is the best pitcher in the league," said his coach, Matt Mosiello. "One of my biggest individual game highlights was throwing a 62-pitch, 8-strikeout complete game at Chaparral this year," Hroch said. "Great defense carried us through that game. "My key to success has been my hard work and my dedication to my team. I realized going into my senior year we needed a leader and I thought, 'Why not me?" Hroch was quick to give credit to his teammates for all that has happened this spring. "The key to this team's success has been our true team camaraderie," he said. "We don't have any problems in the locker room and everyone pushes their teammates to be better. I have never been part of such a special and loving group of brothers and teammates." Ollison was 15-5 with a 2.83 ERA for the softball team, which compiled an 18-8 record and advanced to the third round of the CIF playoffs. Ollison, who has been playing softball since the age of 5, has committed to Canisius College in Buffalo, New York, even though she is just a junior. "Canisius College just seemed to be the place for me," she said. "I wanted to try something new, so this Cali girl is going across the country. It fit all of the things I am looking for in a school and just made me feel like home when I was clearly not. Canisius did put a lot of energy into recruiting me and I did have other offers, but having a feeling of 'this is where I want to be' made my decision that much easier." Ollison said her most memorable game of the season was the third-round playoff game, even though it resulted in a 4-1 loss to Los Alamitos. "That game was a rematch from preseason, and it was a close game the first time through, so the second time around we were coming to fight," she recalled. "The command I had over my pitches was on another level and the energy that not only I had but that my team shared made that game one I will remember for a very long time. "I had great expectations going into the season, knowing how many quality athletes our program has. For me personally, I wanted to become more dominant than past years and become a better leader. I also greatly wanted to earn the respect of all of my teammates, along with helping my team earn many victories." These are the final Athletes of the Month from Vista Murrieta to be honored this school year. Congratulations to all who were honored. Anyone wishing to purchase a print copy of this article may do so by emailing murrieta247info@gmail.com.